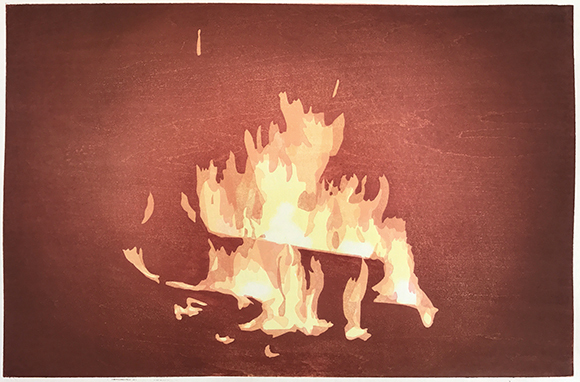 Shapes derived from four video stills of a bonfire. 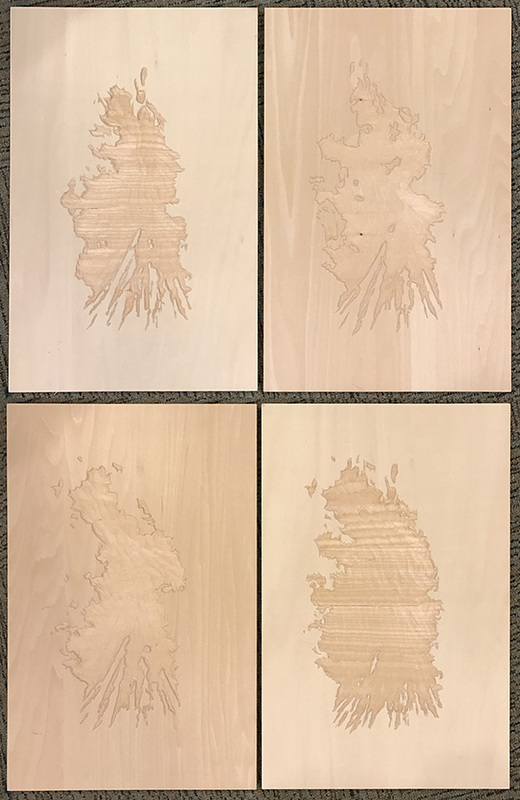 I've been working on these prints for almost a year now. After the 2016 election I was so upset and thrown off my game that I could barely tear myself away from the news cycle and drag myself into the studio. When I finally got going again, it was images of fire that matched my inner felt sense* (see below for definition). My usual way is to just dive in and go once I choose a direction, but for reasons unknown to me I spent most of the spring and summer test printing the blocks for this series. For the past two months, and probably for another couple of months ahead, I'm editioning the prints, probably 10 or 11 different designs in total. So today, I give you "Bonfire." Less intimate than a hearth, a bonfire conjures up a larger gathering, in a park or on a beach or in a back yard — like a campfire, but bigger. 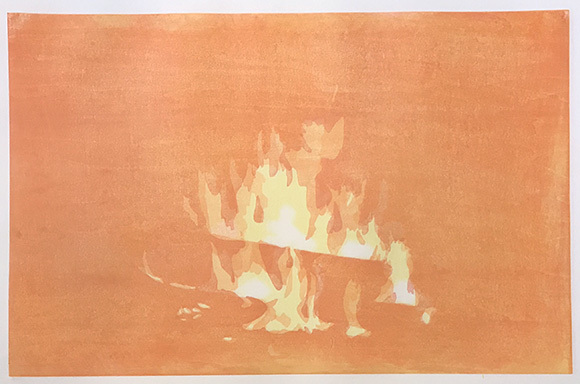 On a darker note, the image of a bonfire can also suggest a ritual burning of objects deemed immoral, a "bonfire of the vanities" such as book burning or burning of art as conducted by iconoclastic religionists or authoritarians. Bonfires can also be included as part of a protest or riot. 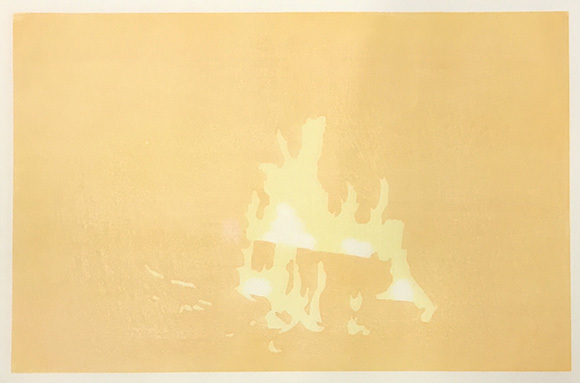 As with all of these prints, I'm depicting the flames, not the fuel. Below are the blocks showing the four different shapes derived from a video that make up the print. This is a term from a psychotherapeutic technique called Focusing. A felt sense is a body sensation that is meaningful and that points to and somehow matches a vague, elusive and often pre-verbal inner experience. I think that locating the felt sense of any particular experience or situation is useful for artists and is in fact often used by artists intuitively — that moment of aha, when an image just feels right. 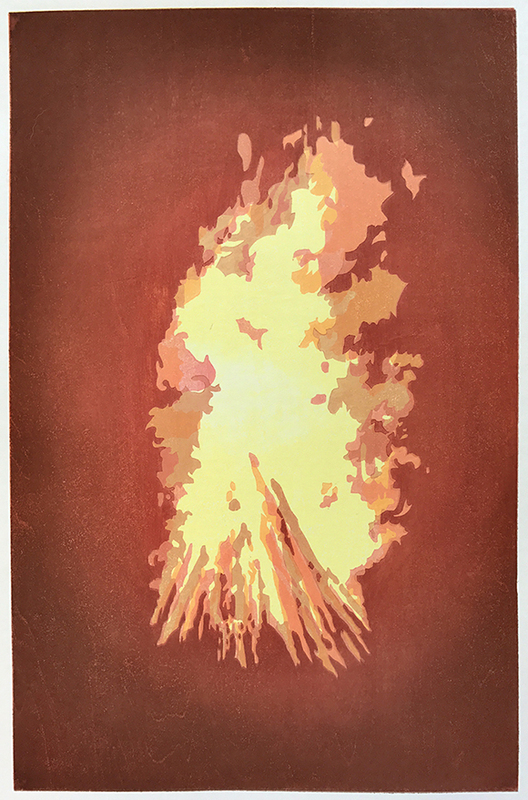 Based on five video stills of a fire burning in a fireplace. Hearth has the word heart in it, and for many centuries (or maybe even forever) the cooking fire has been the heart of human life. It wasn't until 200 years ago that the open hearth was replaced by a fire in a "box," with a flat top and oven, and it was another 100 or so years before modern ranges, gas and then electric, became common. My own grandmother's electric range had a small attached wood stove that she used for heat and for warming food as late as the 1970s. 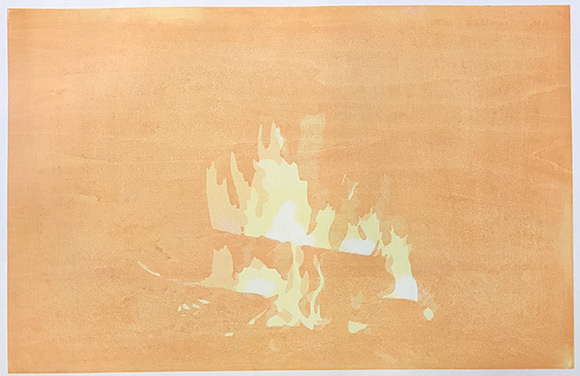 Lynn and I heated with wood for three years when we lived in Taos, New Mexico. It was messy and a lot of work, but I loved it. Chopping wood, hauling it into the house as needed, banking the coals overnight and then firing the stove back up in the morning — those rituals became embedded in our days and connected us to natural rhythms that you just don't experience when your "home fires" are unseen in the basement and you simply turn a dial to make heat. I recently read that watching a fire in a fireplace or fire pit lowers blood pressure, and the longer you watch the lower it goes, so who knows, maybe our love of hearth is biological. If you've never seen Michael Pollan's series, "Cooked," it's pretty interesting. The first episode is about fire. I grew up with a fireplace. My dad loved making fires, and he showed me how to open the flue, how to warm the chimney and get the draw going, how to bank coals, and how to add wood so that it wouldn't smother the embers. When Lynn and I bought our first house, having a fireplace was high on our list of must-haves and we used it a lot. Now we have a gas hearth, which is nice and easy and not at all messy or smelly, but I miss the rituals involved in tending a wood fire. 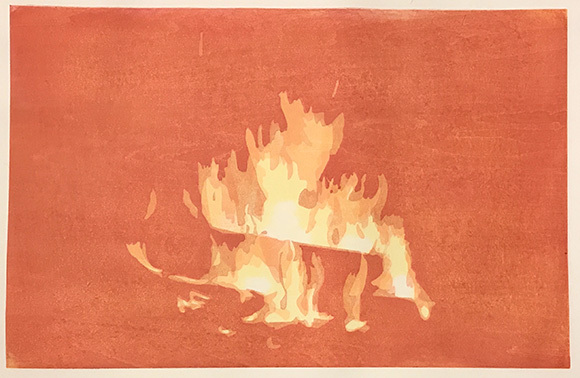 So the fourth print in this "Playing With Fire" series is a hearth. Two colors with some yellow wiped away to reveal the white of the paper. Another block printed. This block had a fairly strong grain pattern. Next I'll be darkening the background and adding some bokashi (gradation).